The widespread attacks in Sunni areas across Iraq on Thursday are a direct threat to the new interim government which is to take over on 30 June. The government is faced with the huge problem of trying to restore order and, if it does not, with the prospect of continued fighting. Dozens of Iraqis as well as some American soldiers were killed in the assaults on military and government installations. Its dilemma is that it must rely on American and other foreign troops, but it is the presence of those troops which motivates the insurgents. Attacks in the run-up to June 30th and beyond were predicted by coalition officials, but that does not diminish the threat they represent. The insurgents have demonstrated that they are capable of organising co-ordinated and destructive operations. A website in Saudi Arabia claimed that attacks in one city, Baquba, were the work of the Islamic fighter Abu Musab al Zarqawi. A statement said that residents should stay indoors because there would be more attacks in the coming days against what were described as "the occupation troops and those who stand beside them". Zarqawi has previously threatened the interim Prime Minister Iyad Allawi with death, so it is clear that the interim government is the target, not just the American and other foreign forces. 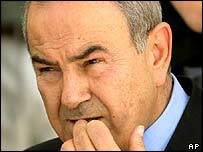 "As for you Allawi - sorry, the democratically-elected prime minister - we have prepared for you a deadly poison and a sharp sword, and we have filled for you a glass overflowing with the stench of death. "On several occasions in the past, without knowing it, you escaped well-planned traps that we set for you. "However, we promise you that we will continue the game with you to the very end. " The interim government will be hard pressed to restore order. It has threatened to impose martial law, though what difference that would make is unclear. It hardly has the forces to impose curfews, and there are even reports that in some cities, the local police are fraternising with the rebels. Its real problem is that it will be an unelected government, so cannot claim popular legitimacy. Elections are due by the end of January to a National Assembly which will choose a transitional government. This in turn will give way to a fully elected government by the end of next year. The question is whether the insurgents will at any stage accept any of these governments, especially if foreign troops remain.